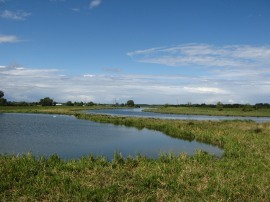 I did this walk on Sunday 5th August 2012. 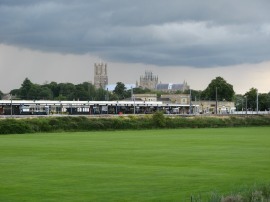 I drove up to Ely station, where a days parking was just £1 on Sunday, before taking the train down to Cambridge. 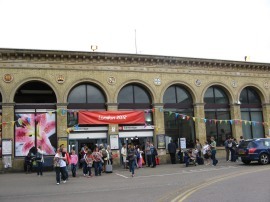 The train was quite busy and it was standing room only for the short journey down to Cambridge Station which marks the start of the Fen Rivers Way. 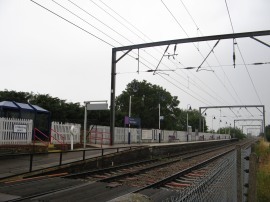 From the station, photo 1, the route heads down Station Road before turning to the right along Hills Road. 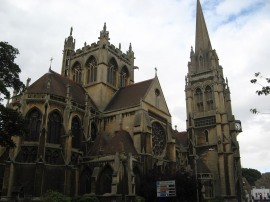 This is followed down to the junction with Gonville Place by the very large Our Lady and the English Martyrs Catholic Church, photo 2. 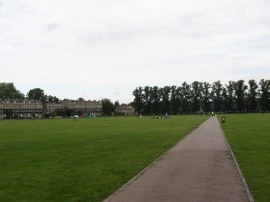 Here the route heads briefly to the right along Gonville Place before joining a footpath that heads diagonally to the left across Parkers Piece, photo 3, a patch of open common ground close to the centre of Cambridge. 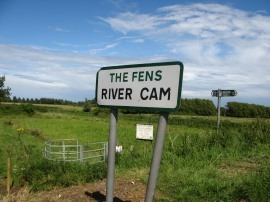 Reaching the far side, the Fen River Way heads to the left along Parkside before continuing ahead along Parker Street. Reaching the gardens of Christ's Pieces the route heads to the right down Emmanuel Road before crossing over Maids Causeway into Midsummer Common, photo 4. 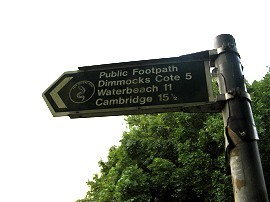 It had been a pleasant walk through Cambridge and the path now headed round the edge of the common down to join a path running alongside the edge of the River Cam, photo 5, where I linked up with the route of the Harcamlow Way which I had walked back in 2010. 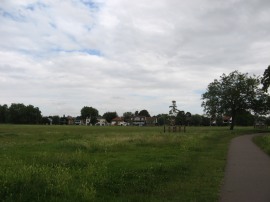 The path then heads downstream along the river running alongside Midsummer Common. 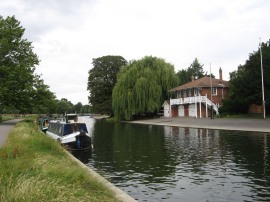 On the opposite bank the river was lined by a large number of rowing club houses belonging to the various Cambridge University colleges. 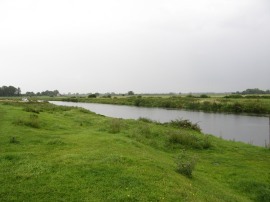 After crossing under the A1134 the route joins a minor road, the appropriately named Riverside, running along the edge of river, photo 6. This is followed down to reach Stourbridge Common where there was a small information board for the Fen Rivers Way, the first indication of the walk I had seen on the ground. Here I left the Harcamlow Way, heading to the left through an avenue of trees down to take a footbridge that crosses over the River Cam, photo 7. 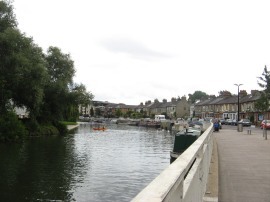 The route then heads to the right along Water Street before joining a footpath running alongside the river which the route was to follow for most of the remainder of the days walk. Between Cambridge and Waterbeach the path was a well surfaced shale track which made for easy walking and it was not long before the buildings of Cambridge were left behind and the path was heading through open countryside. 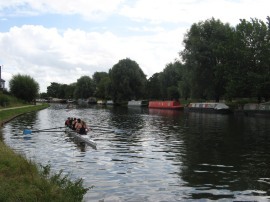 The river was being well used by an assortment of rowers in various sized boats, some being followed by coaches on bicycles shouting instruction out across the water to the rowers, photo 8. 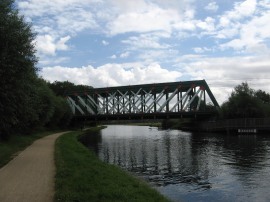 The river heads out under the main line rail bridge, photo 9, and on to pass under the A14 dual carriageway. 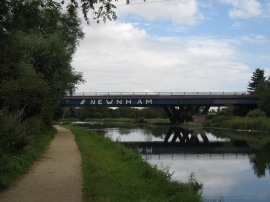 This bridge, photo10, has been painted with the name of Newnham College for the last couple of years, previously it had said Queens and I think is related to Cambridge rowing rivalries. 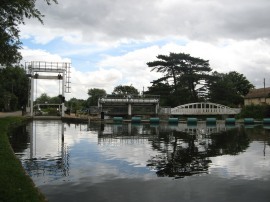 A short distance downstream from the road the river reaches the attractive Baits Bridge Lock and Weir, photo 11. 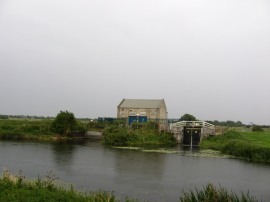 Given the flat nature of the Fens this was the first of only two locks on the river that I passed all day. 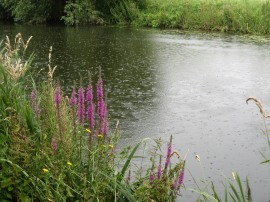 I stopped for a quick snack break besides the lock and whilst I was eating I felt a few drops of rain start to fall. It had been a generally bright day but for some time a large bank of clouds had been gradually massing behind me, slowly coming closer on a day that was almost windless. On the way up to Ely the weather forecast had mentioned the chance of scattered showers and also that with the lack of wind, if you did encounter one, that they may last for some time which proved very true as it continued to rain for almost the next two hours, accompanied by the odd flash of lightening and rumble of thunder, even though for most of the time I was able to see blue sky away to my left. It was too warm to wear waterproofs, and in a complete break with tradition, I changed into a pair of shorts and just continued on through the rain, photo 12. 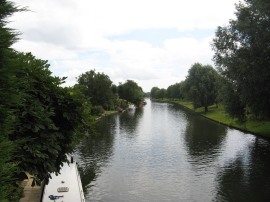 Reaching Clayhithe the route has to briefly divert inland away from the river, following a cycle track that runs up to Waterbeach Station, photo 13. Here I joined a short stretch of footpath than ran alongside the railway lines before joining another path on the right that heads back down to the river. 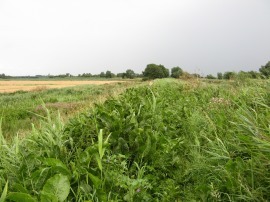 The Fen Rivers Way then rejoins the grass covered path running along the top of the flood bank, photo 14, following the river across the flat level fields of the fens. 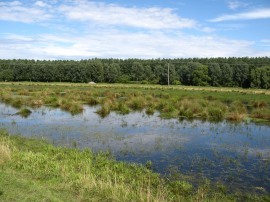 With the drainage of the fens the surrounding land has sunk and is often well below the height of the river. 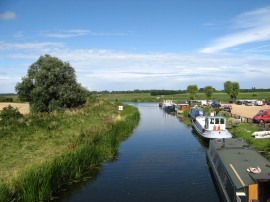 Not far from Waterbeach the river passes through Bottisham Lock, photo 15, although the path steers well clear from the lock itself. 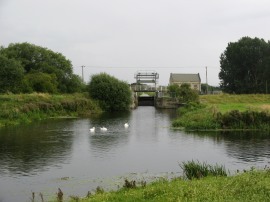 There are a number of large drainage channels feeding into the river from the surrounding fenland, some like the Swaffham Bulbeck Lode, photo 16, which are big enough to have their own locks at the entrance. 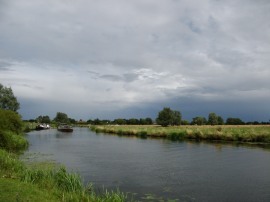 Continuing on through the flat countryside, photo 17, the river passes Reach Lode, where there is another lock leaving the river, photo 18 and also a small marina and a few houses at Upware on the opposite bank providing a brief interlude from the endless fields. From Bottisham Lock onwards the quality of the path deteriorated as it became very overgrown, photo 19. Not only did the tall greenery lining the path soak me far more than the rain had there were also a large number of stinging nettles amongst the undergrowth ready to attack my legs.The storm eventually began to pass over, photo 20 and the sun started to come through, instantly brightening up the landscape around the river, photo 21. Between Cambridge and Ely the Fen River Way is way marked along both sides of the river and for a while I was keeping pace with a group of three women walking on the opposite bank. Scattered amongst the dense greenery lining that lined the path in places were a considerable amount of slugs enjoying the damp weather and these were provoking an endless stream of screams from the other side of the river which I found rather irritating in the otherwise tranquil landscape. 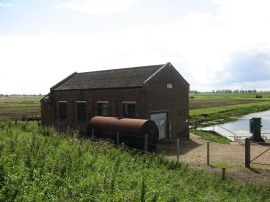 Due to the low lying nature of the fens several of the drainage channels required pumping stations to raise the water up to the level of the river, photo 22. After another mile or so the route heads up to cross over the A1123 road, photo 23, the first road that had crossed the river since Clayhithe. 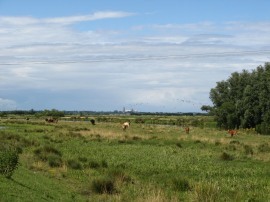 The path then skirts around the Wicken Washes, photo 25 where the partially flooded meadows besides the river were being gazed by cattle, photo 26. 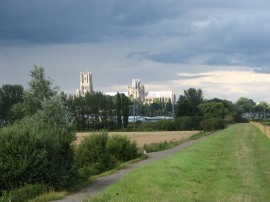 On this stretch of path I got my first sight of Ely Cathedral rising above the surrounding countryside although there was still over four miles to walk before I reached Ely. I also got to see a very large flock of Canada Geese come flying over. 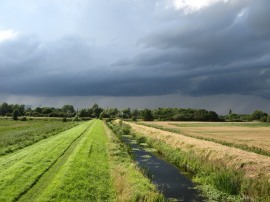 Over to my left another very large bank of dark clouds was building up along with further rumbles of thunder although these did not quite reach the river and I was able to complete most of the remaining walk in the bright sunshine, photo 27. 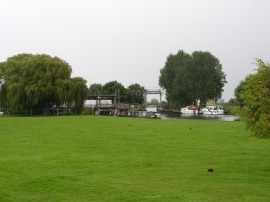 Next up the path reaches another Marina and the junction of the River Cam with the River Great Ouse which joins from the left. 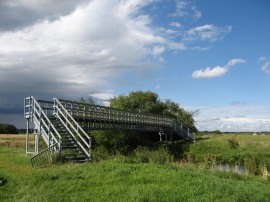 An arched footbridge, photo 28, carries the Fen Rivers Way over the Ouse, photo 29, and back onto the flood bank. 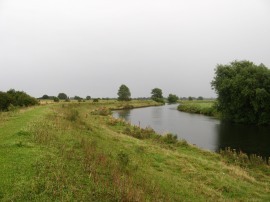 Although the River Cam was the larger of the two rivers it is actually the River Cam that flows into the River Great Ouse, photo 30 and which the Fen Rivers Way now follows for the remainder of its journey. 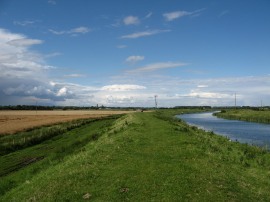 For much of the walk railway lines between Ely and Cambridge have followed the course of the river, and this was another stretch where the railway came quite close to the path. 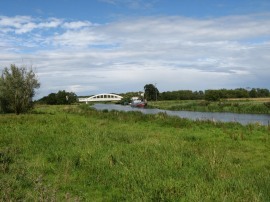 On the right the Soham Lode joins the river and then the path crosses over a metal footbridge, photo 31, over Braham Dock, photo 32, which is actually just a drainage channel. Photo 33 was taken looking in the other direction from the bridge and highlights the different weather on either side of the river. 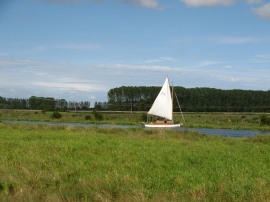 Ely cathedral was growing steadily larger ahead as I continued down river, passing a sail boat that had run aground against the bank, photo 34. 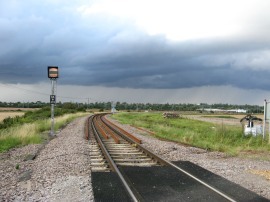 The footpath then heads up to cross over the Ely to Ipswich rail line, photo 35. 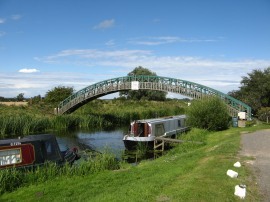 In June 2007 the rail bridge over River Great Ouse was severely damaged by a freight train which derailed whilst crossing over it, closing the line for six months. 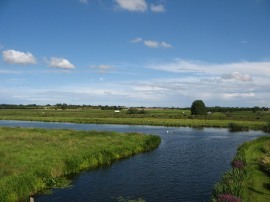 From there it was just a short distance further along the flood bank, photo 36, now running some distance away from the river, up to the A142 road on the outskirts of Ely where I finished this stage of the walk. From there it was just a short walk over to the station, photo 37, and the car. Arriving back at the car I had walked a total distance of 17.9 miles. It had been a pleasant walk, despite the damp weather in the middle and the overgrown sections of path which made it hard going in certain small sections. 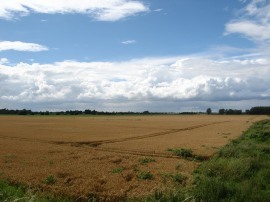 Whilst the scenery was nothing special it was a different landscape for me to be walking through and the big skies with the storms going across did provide some interest and I am looking forward to walking the next two stages up to Kings Lynn and the Wash.
As usual I have uploaded the route of the walk which can be accessed here: Fen Rivers Way 1 route.